When Manor Tool & Manufacturing Co., Schiller Park, IL, recently implemented its lean initiative, staff kept a keen eye on safety, which it felt could be improved—along with production efficiency—through lean management. Manor, which produces a diversified product mix of medium- to long-run stampings, began its lean journey by rolling out 5S. And, as it started examining its processes through the lean initiative, it quickly became apparent that flexible does not necessarily equate with lean or with safety. As an example, general manager Kevin Segebarth points to its press-feed lines. Traditionally, feed lines at Manor had never been secured to the floor nor tied to a particular press. This allowed the team to move equipment around to meet the needs of any job as it arrived. Through kaizen events, Segebarth and his team realized that this approach had a negative impact on setup time, as equipment relocation, leveling and securing required as long as 3.5 hr., not to mention coil-change time. While looking for efficiency and process standardization, the company decided to conduct a study to look at its minimum/maximum coil-width requirements and the variety of material types and thicknesses being processed through its 200-ton Bliss press. Deciding on a 24-in. 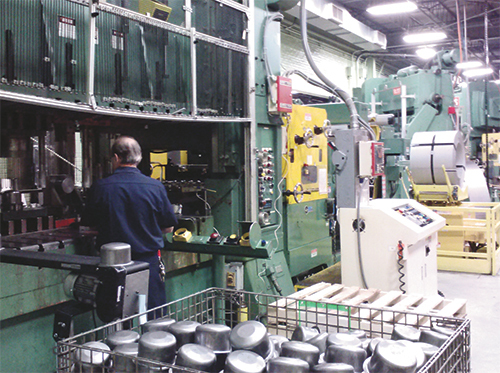 maximum-width feed requirement, the company turned to Coe Press Equipment, Sterling Heights, MI, to see what solutions it could offer. 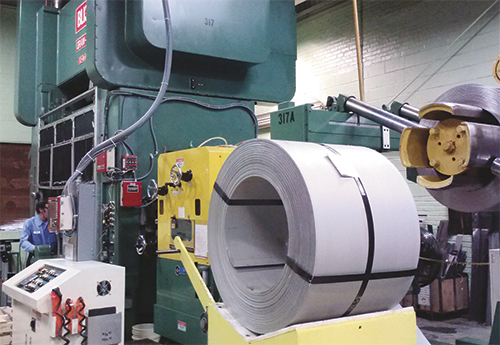 Given the processing requirements and floor constraints at Manor, Coe recommended its SpaceMaster Series 3 compact coil line, which combines unwinding, straightening and feeding into one piece of equipment. Depending on material yield strength, this line provides Manor the flexibility to process material from 10- to 24-in. wide over the thickness range of 0.020 to 0.250 in., with a maximum coil weight of 11,000 lb. Noting the throughput increase from the switch to a dedicated feed line, Manor quickly invested in another Spacemaster to feed its 400-ton Bliss DrawLink press. It’s able to handle coil from 10- to 40-in. wide of material 0.015 to 0.250 in. thick, with a maximum coil weight of 15,000 lb. What about safety? Morford and Segebarth note a huge improvement here as well. The previous setup with feed lines not bolted to the floor exposed operators to potential accidents, they say. For example, if the material failed in its feeding cycle, the feed line would stop, yanking the equipment off-kilter and pulling derailers out of position. Additionally, clockspringing of the coils was difficult to contain when loading coils onto the reels. With the SpaceMaster solution, the coil car loads the coil on the reel, positioning it safely where the bands then can be cut without any coil or clockspring. This eliminates the need for a material handler, since once the material is unbanded and aligned with the feed it automatically feeds into the press.